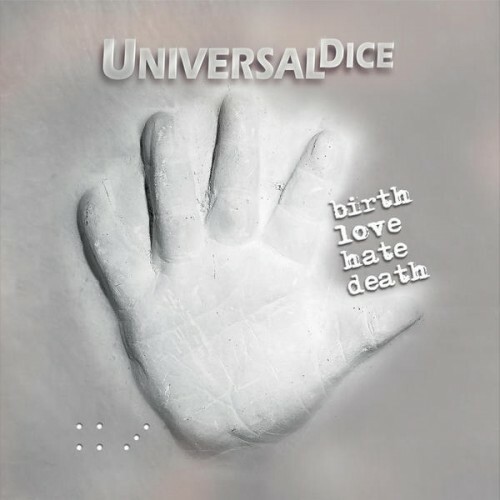 Welcome to the World is the first track on UniversalDice’s new album birth, love, hate, death, providing fans with a straightforward rock style that builds off of performers like R.E.M., The Cars, and The Minutemen. The eclectic sound of this introductory effort showcases a trend that will continue throughout the entirety of the album. A lush production allows each element – the guitars, drums, bass, and vocals – equal time to shine. I Wish I Could Tell You This has the soulful guitar work of Eric Clapton or Mott The Hoople. A sedate and carefully laid down set of vocals ensure that fans will be eagerly devouring each and every word. The taut instrumentation will stand up to repeat plays, not only on this effort but on songs like My Hands Are Tied. My Hands Are Tied is the diametric opposite of the aforementioned cut. A high tempo and punchy instrumentation ramps up birth, love, hate, death’s energy. The vocals on this single pull double duty in that they add to the song’s harmony while telling a story. I Love It When They Hate It has a funkier, more bluesy sound to it (imagine The Rolling Stones meeting The Who); the vocals build off a Billy Bragg and Elvis Costello sound here. I’m No Good For You has an infectious dynamic crafted between the vocals and the instrumentation. Quite a few listens will be needed to hear every twist and turn that has been included within.One Day At A Time, the penultimate effort on birth, love, hate, death will impress with a touching and emotionally effecting sound. The hopeful sound of the track colors the final statements on this CD, providing fans with a bit of happiness as the album begins to spin to a close.